As marketers, we know that the quality of the leads we generate directly impacts our brand’s success. 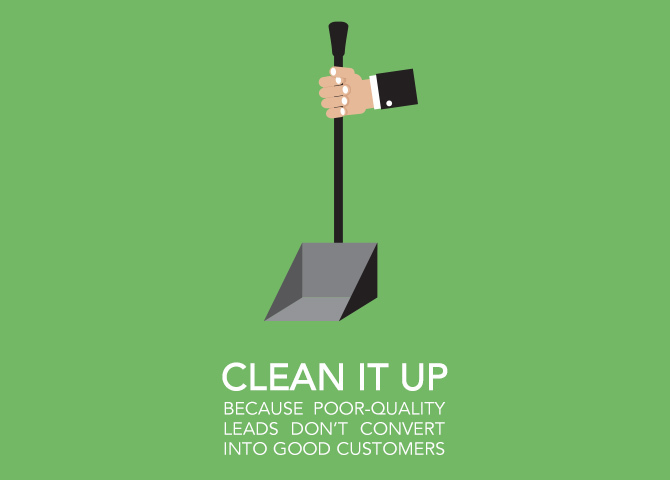 Simply put, poor-quality leads don’t convert into good customers. Therefore, don’t spend your time on them– it’s a waste of time and money. It is now more critical than ever that marketers re-evaluate their demand generation strategy and spend to focus on driving the right leads, not just more leads. Indeed, marketers are aware that their strategies need improving, and are redefining their values and best practices. In fact, according to the 2015 “Demand Gen Report Benchmark Study: What’s Working in Demand Generation,” more than one-third of B2B marketers surveyed said they planned to increase their demand-generation budget by 20% in 2015. And it seems like marketers are more aware of the state of their data quality. Of the B2B marketers surveyed, 74% reported that producing greater lead quality, as opposed to lead quantity, was their top demand-generation priority this year. To me, that shows much greater self-awareness than I’ve seen in the past. Assess the damage: When is the last time you conducted a deep audit of your business contacts database? If you can’t recall, then your database is most likely comprised of many expired and inaccurate contact records. And, if you’ve been reaching out to these invalid contacts all along, your outbound marketing efforts have been stymied and you are putting your sender score at risk. Clean it up: You don’t have to repair your database all on your own; best-in-class data management technologies are available to do the auditing and cleansing for you. For example, today’s advanced marketing software can complete this legwork by identifying invalid business contacts and providing relevant, accurate entries to replace the others. Target your campaigns: Once your database of marketing contacts is squeaky clean, you still need to segment your leads into different categories based on demographic and firmographic similarities. In doing so, you can send targeted messages, e.g., in email blasts or blog posts, to your different consumer groups. And since consumers want personalized, focused content from the brands they love, this tactic will up your sales and produce happier, more engaged customers. So keep your business’s momentum going strong with a focus on lead quality this year. Increase demand generation productivity by first assessing the state of your marketing database. What are you waiting for?